A must-win game in Week 3 sounds crazy, right? Actually, it’s not crazy at all. Not when the regular season is only eight weeks, you’ve got high expectations and you’re off to an 0-2 start. Indeed, the Killer 3s got their first-ever BIG3 victory, and now Jackson thinks his squad is ready to roll. They didn’t have co-captain Chauncey Billups for the Week 1 loss to undefeated Trilogy. Billups got his feet wet last week in a close loss to Power. With the 51-44 win over Tri-State, the Killer 3s might start gaining momentum. Their first win didn’t come easy — the Killer 3s had to overcome an 11-point halftime deficit. After a pair of jumpers each from O’Neal and Wells, James’ 3-pointer gave Tri-State an 11-2 lead. Jackson and Billups got the Killer 3s back into it, but a Lee Nailon jumper sent Tri-State to halftime with an 11-point lead, 25-14. The Killer 3s clawed their way back, but even after Billups sank a jumper to give the Killer 3s their first lead of the game, James came back with a 4-point shot to put Tri-State back in the lead at 35-32. But after Jackson tied it at 35 on a 3-point play and then a foul shot from Billups gave the Killer 3s the lead again, they never looked back. Up 49-44, Jackson pulled down an offensive rebound and sank the layup that clinched it. Billups (21 points), Jackson (18) and Reggie Evans (12) accounted for all of the Killer 3s’ points. Evans pulled down a BIG3-record 18 boards to notch a double-double. James led Tri-State with 18 points and 8 rebounds. O’Neal had 10 points and 6 rebounds. The Killer 3s are 1-2. Tri-State fell to 0-3. After a quiet first two games, Mahmoud Abdul-Rauf broke out for 22 points – including four 3-pointers – as the 3-Headed Monsters handed Power its first loss of the season in the day’s biggest blowout. Rauf came out on fire, hitting his first four jumpers to give the 3-Headed Monsters an 8-2 lead. Three-pointers from DeShawn Stevenson and Cuttino Mobley got Power back into the game, and a Mobley jumper gave Power a 15-14 lead. Back came Abdul-Rauf, immediately sinking a pair of threes to put the 3-Headed Monsters back up by 5. Another bucket from Abdul;-Rauf sent his squad to halftime with a 26-15 lead. From there, it was all 3-Headed Monsters as they pulled away through the second half. Up 47-32, it was only fitting that Abdul-Rauf hit his final 3-pointer to clinch the win. Rashard Lewis added 20 points and 6 rebounds for the 3-Headed Monsters, who are now tied with Power at 2-1. Mobley (19 points) and Stevenson (11) accounted for all but two of Power’s points. Trilogy remained the BIG3’s last unbeaten, but it wasn’t easy. After Allen Iverson opened the game with his only two points of the contest, DerMarr Johnson and Andre Owens picked it up from there and 3’s Company got off to a 26-23 halftime lead. It remained close in the second half. 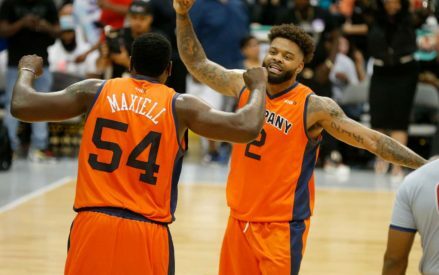 A three-point play from Rashad McCants tied it at 32 and then an Al Harrington layup gave Trilogy its first lead of the game. Harrington then hit a jumper for a 36-32 lead – but Johnson hit a 4-point shot to tie it again at 36. McCants, Harringrton and James White took over from there, and while 3’s Company closed to within 2 at 44-42, Trilogy scored the final six points of the game to end it. For the second straight week, Harrington hit the game-winning shot. Three players scored all of Trilogy’s points – McCants led all scorers with 19, Harrington finished with 18 and White had a double-double (13 points, 10 rebounds). Johnson led 3’s Company with 16 (including two 4-pointers) and Owens had 12. Trilogy is 3-0, and 3’s Company is 1-2. Ghost Ballers co-captain Ricky Davis missed a jumper to start the game, but that didn’t discourage him from shooting the rock early and often. Davis scored 13 points in the first half alone as the Ghost Ballers jumped out to a 25-18 halftime lead. He finished with 23 points overall – best in the BIG3 for Week 3 – and added 9 rebounds. A Marcus Banks 3-pointer gave the Ghost Ballers a 34-23 lead midway through the second half, but the Ball Hogs would not go away quietly. Thanks to the hot hands of Rasual Butler (19 points, 4 rebounds) and Derrick Byars (10, 6), the Ball Hogs went on a 13-2 run. Josh Childress scored three of his 10 points on a jumper and subsequent foul shot that tied the game at 36. The Ghost Ballers then went up by 6 and the Ball Hogs came back again. A Butler 3-pointer brought them to within 46-45, but that would be it. Johnson made it 48-45, and then Davis closed it out with the game-winning jumper. Johnson added 16 points and 9 rebounds for the Ghost Ballers, who have won two straight to improve to 2-1. The Ball Hogs are 1-2. 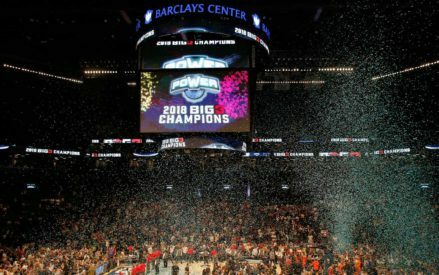 Next stop for the BIG3: July 16 in Philadelphia. Of course, the big story of the day will be Allen Iverson’s return to the City of Brotherly Love. But it won’t overshadow some big matchups. One of those will be the Killer 3s looking to stay hot against the 3-Headed Monsters. Jackson said Evans will need another big game on the boards. For his part, Jackson is ready to take on the 3-Headed Monsters’ captain. “I‘ll have my hands full with Rashard Lewis but I’m up for it,” said Jackson. “I’m game. I love to compete. I can’t wait.